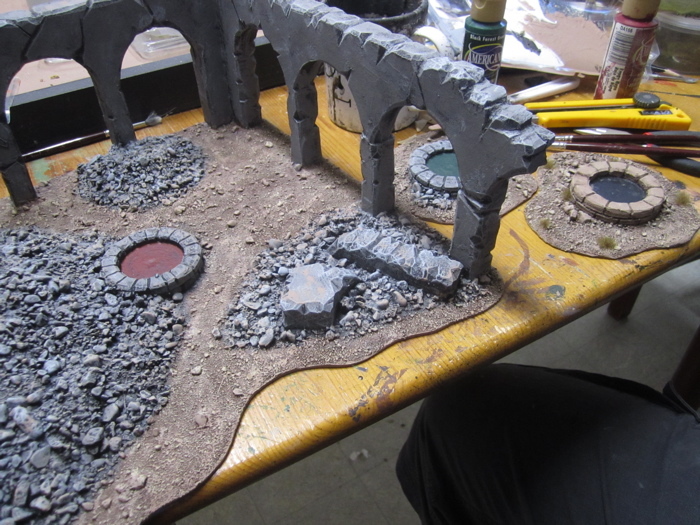 When we started playing Frostgrave back in the fall I got thinking I should make some MORE ruined city terrain. 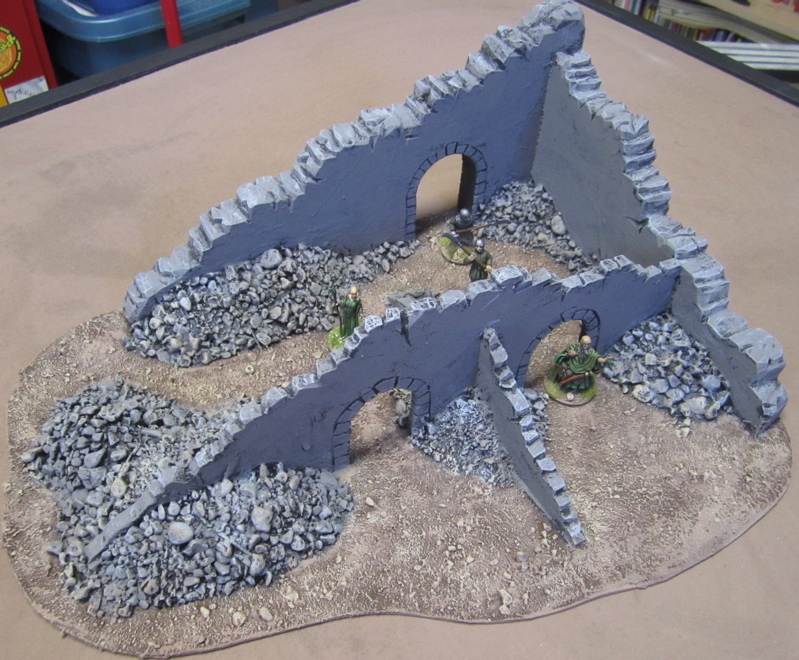 The Ruined City Terrain I originally make I've used for everything from Cold War Gone Hot to World War Two to Weird War Two to Post-Apocalyptic to VBCW and such and much, much more (that I can't find quickly enough to add to this post...). 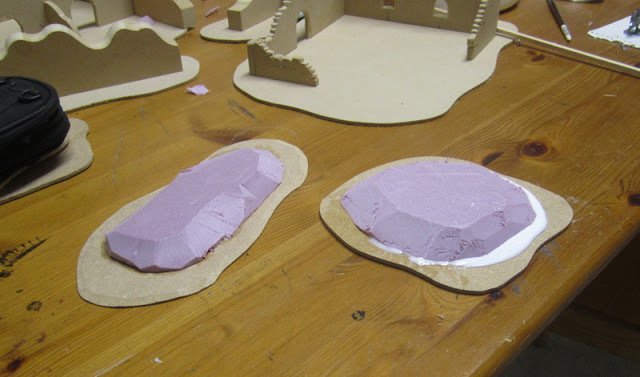 Many have asked me to do terrain making tutorials when I got to making stuff again, so I tried to take pictures as I went to try and put together a tutorial afterwards. 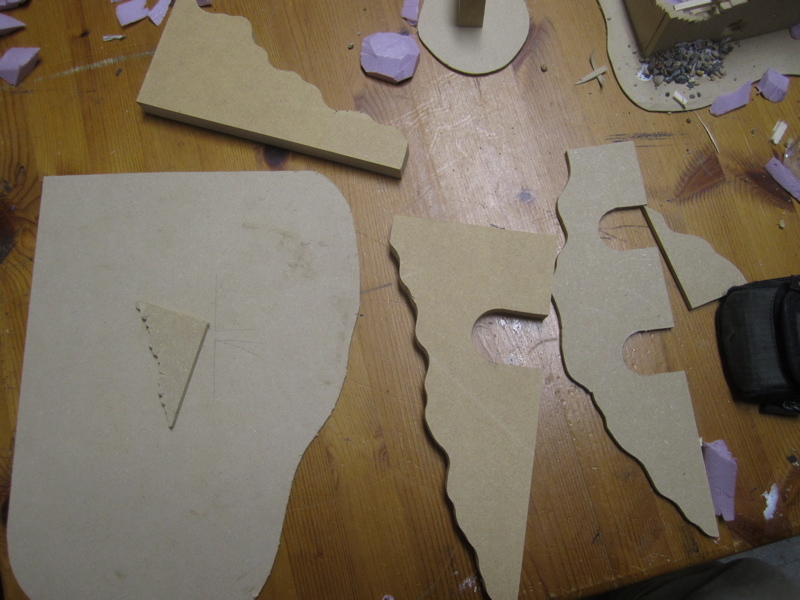 but as I get going I forget to take pictures as I get involved in MAKING STUFF. 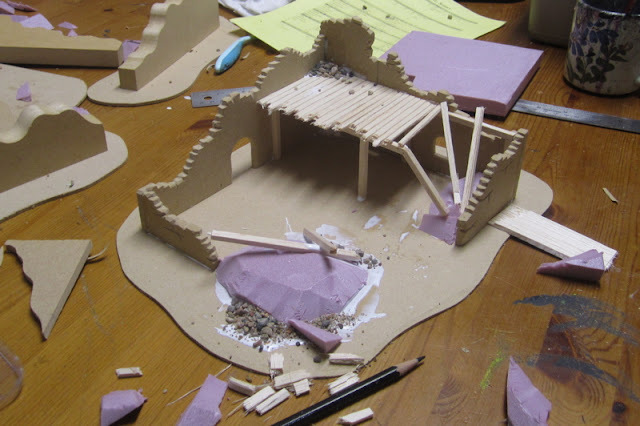 So what follows is less of a "Tutorial" or "How-To" than a few process pictures and an attempt to briefly explain the madness that goes on behind the scenes in Tim's Terrain Building Workshop. 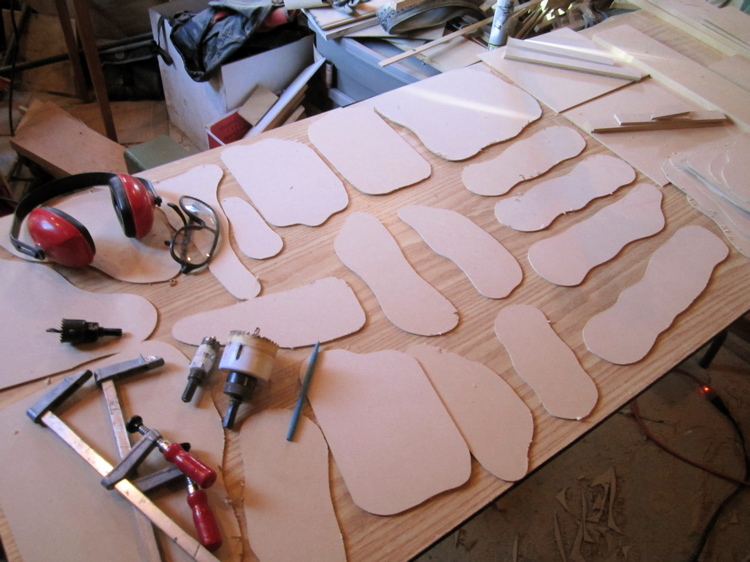 The first pictures were taken last autumn when I got started on this. 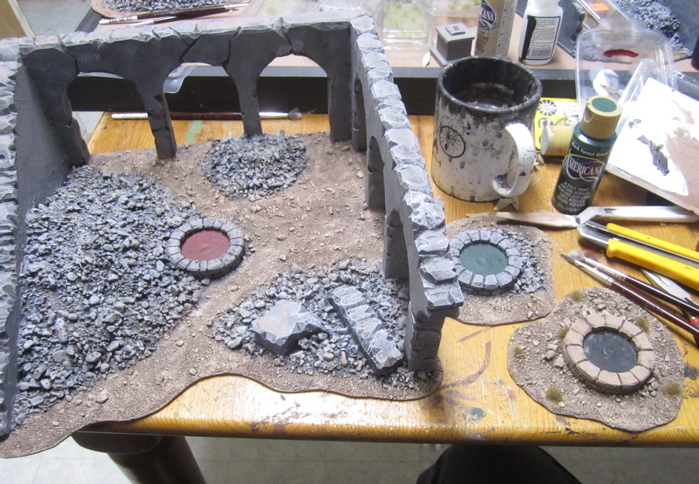 I spent an afternoon or two working on this stuff and then it got cold or I got lazy or simply busy with other things (you know how it is...) and didn't do any more work on any of this until about three weeks ago when I started ramping up preparations for the Frostgrave Campaign Weekend - which just finished (expect a full report of the weekend's shenanigans shortly...). 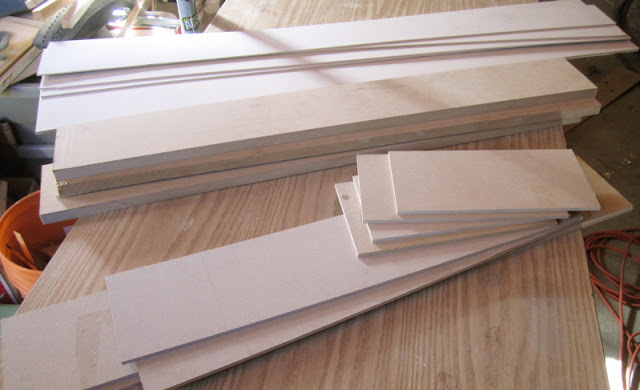 First I cut a bunch of MDF panels into strips of 1/8", 1/4", and 3/4" on a tablesaw. 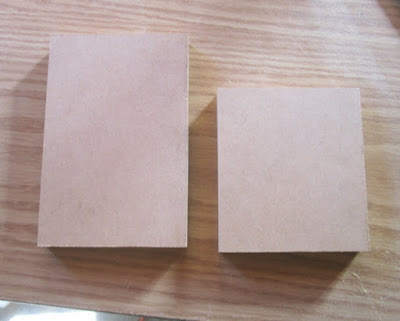 The 1/8 and 1/4 I bought panels specifically for hobby projects, the 3/4 I recycled from some shelves that had been built in our house by the previous owner and were torn out a couple years back when we did some extensive renovations. 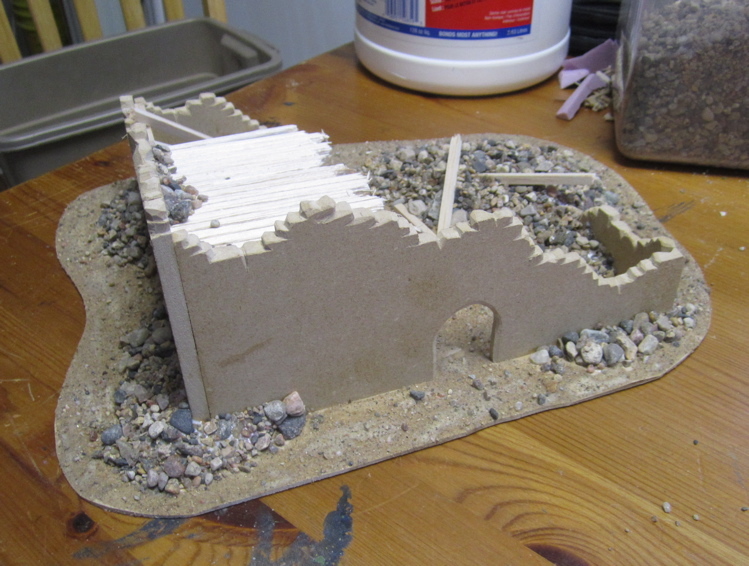 Don't ask what the widths of the strips were - I don't remember... and I didn't take notes... and to be honest I didn't even have much of a plan - with terrain building (especially RUINED terrain building) I kind of just make it up as I go. 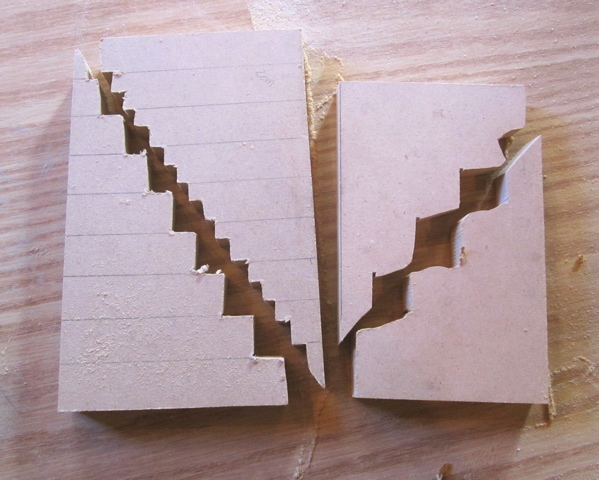 If I had to guess the strips ranged from 4" wide to 6"...? Next I cut a wavy/jagged line down the middle of a bunch of the 1/4" and 3/4" strips... both halves will be used as ruined walls. 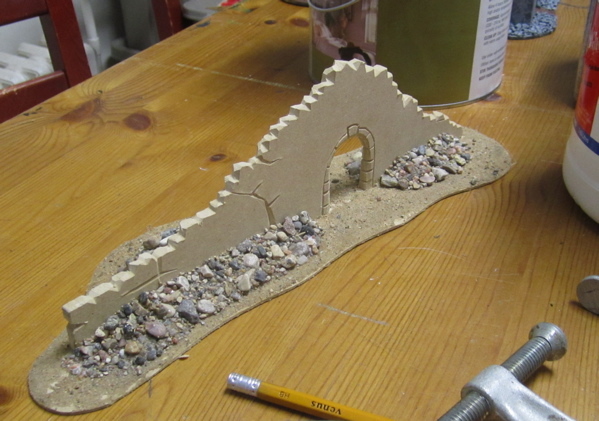 Here's an example of a partly built ruined wall bit - the base is one of those pieces of 1/8" MDF. The wall is 1/4" MDF - I made the broken tops of the walls more jagged by cutting them with an Olfa utility knife. 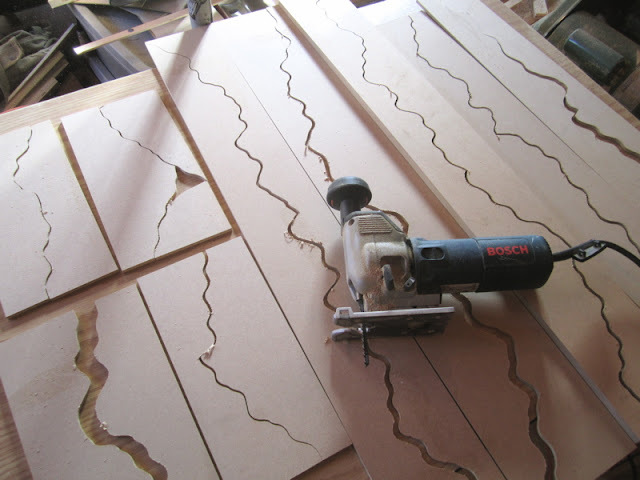 This is really the most time-consuming part of hte process - carving the edges of the MDF to make it look like broken wall.. 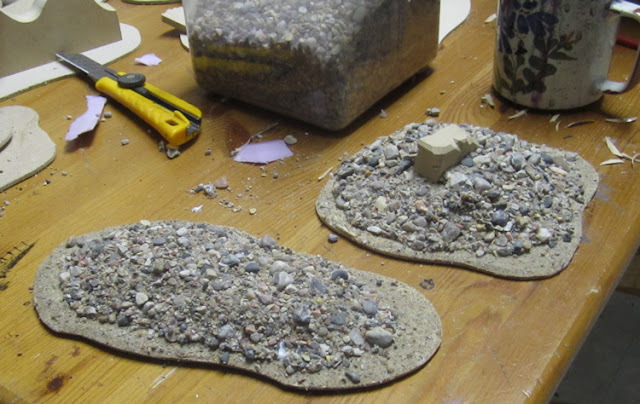 I put some sand on the base and little bits of extruded polystyrene which were then covered with small bits of gravel. 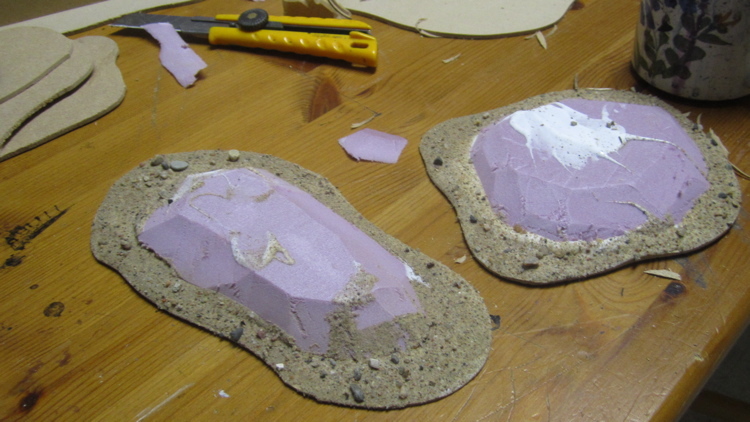 There will be more detailed pictures of this process below. 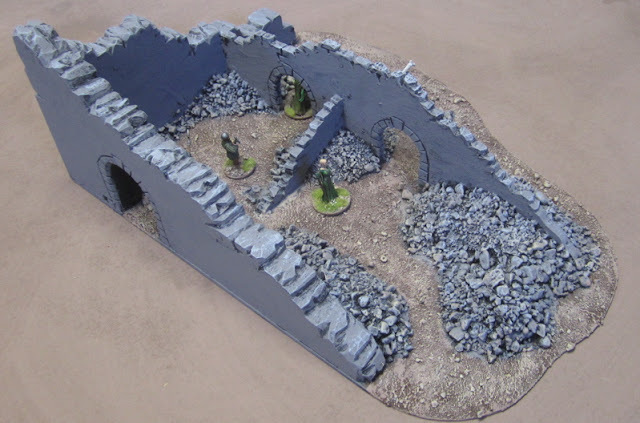 I also made some simple piles of rubble - to block line of sight (or at least give some cover) and create areas of bad-going. 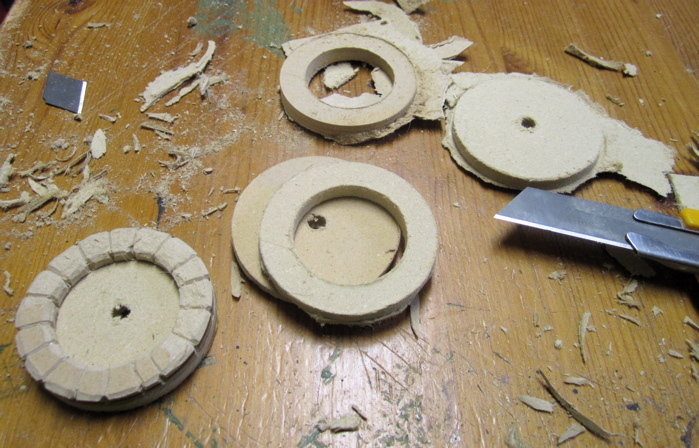 These were simplpy 1/8" MDF bases with extruded polystyrene glues on. 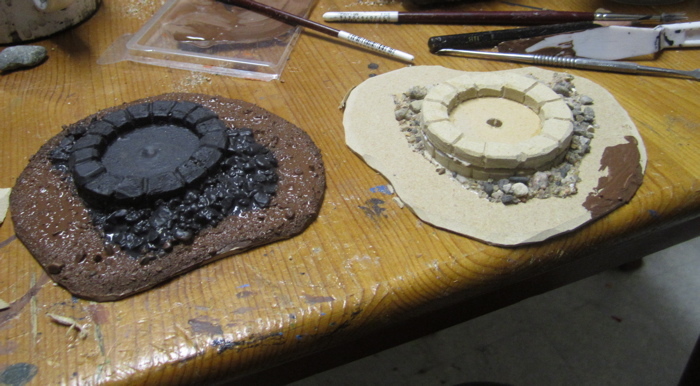 Some sand was added to the bases. The rubble piles with some recently make wall bits. 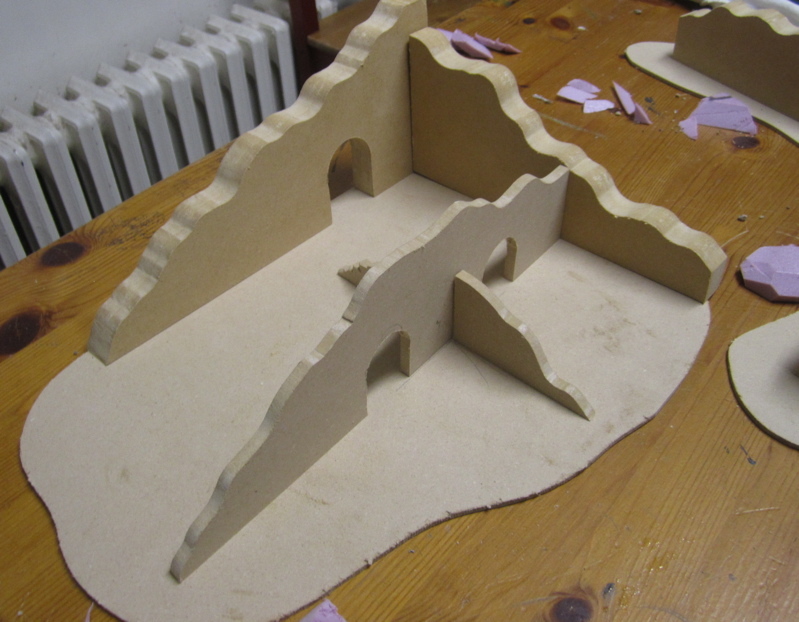 When I got workign on it again a few weeks back I decided to add a pool (or maybe that had been my plan all along...?) as well as a few freestanding pools - that could be used for the Well of Dreams and Sorrows scenario (on of my favourites) or something similar. I made these pools by cutting pairs of circles in 1/4" MDF with hole-saws. (I think they were 2.5"...?) 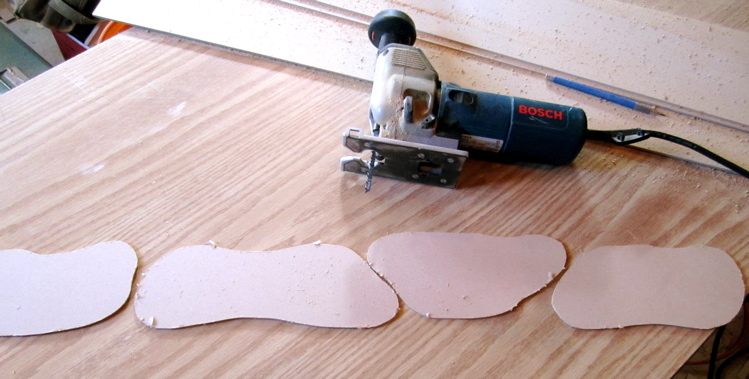 and then one of each pair I carefully drilled out with a spade bit. Afterwards I carved them with the utility knife to make them look like rough (or worn) stonework and found bases for the standalone ones - not circular bases, but odd-shaped. 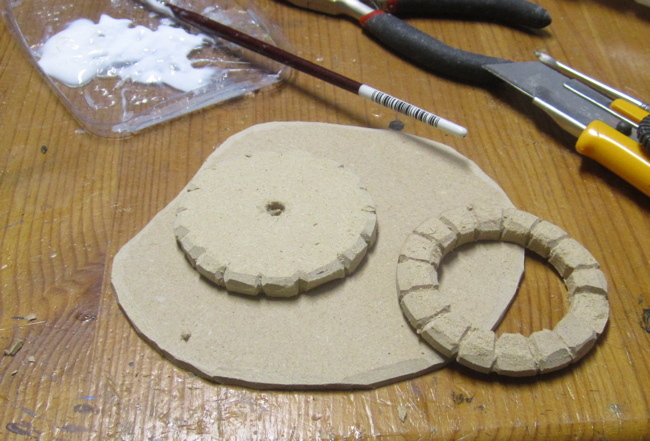 The top (hollowed out) bit was glued onto the bottom bit and then glued to the base with Weldbond (a carpenter's white glue - which is what I do pretty much all my terrain gluing with). then some sand was added to the bases and a bit of gravel to make some rubble or loose stones. 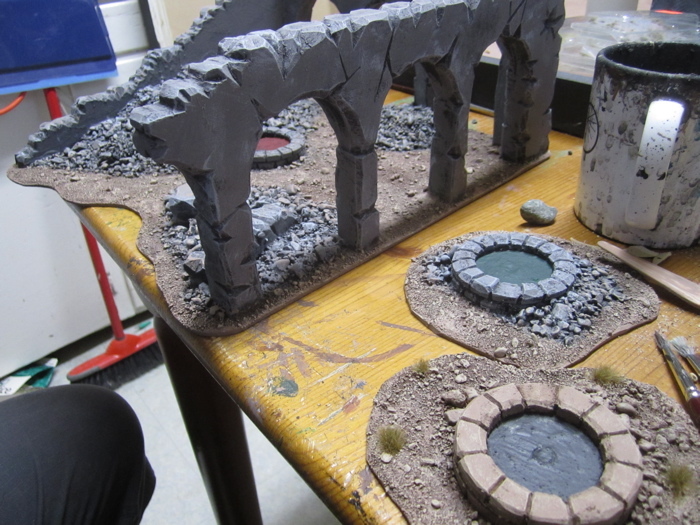 More shots of the painting stages. 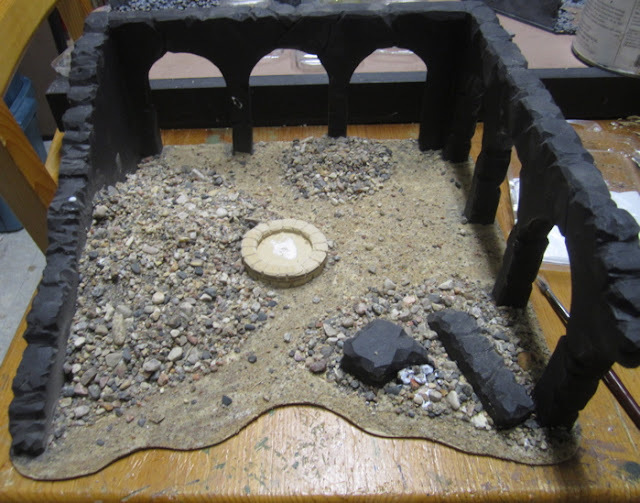 I did some "experimenting" with the liquids in the pools... layes upon layers were added until I was not so much satisfied as sick of it and decided what I got to was good enough (look for the finished pools in game reports!) and then added a layer of gloss varnish to make it look a bit more reflective. 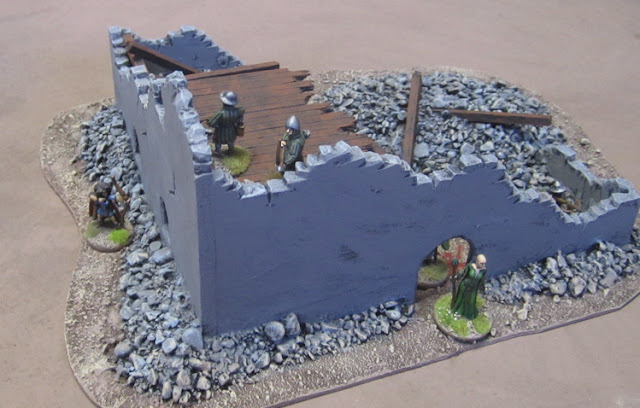 a ruined building - made from those same ruined wall bits above - fashioned together on a bigger base. This one I tried adding a partial second floor. I wasn't totally happy with the results - I think I made the second floor 2" above the ground floor - which just wasn't tall enough. 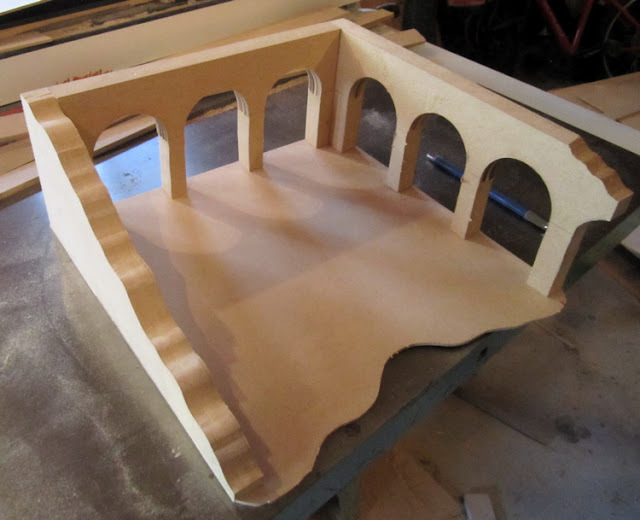 When I get to doing more I'll make the second floors AT LEAST 3" above ground level! 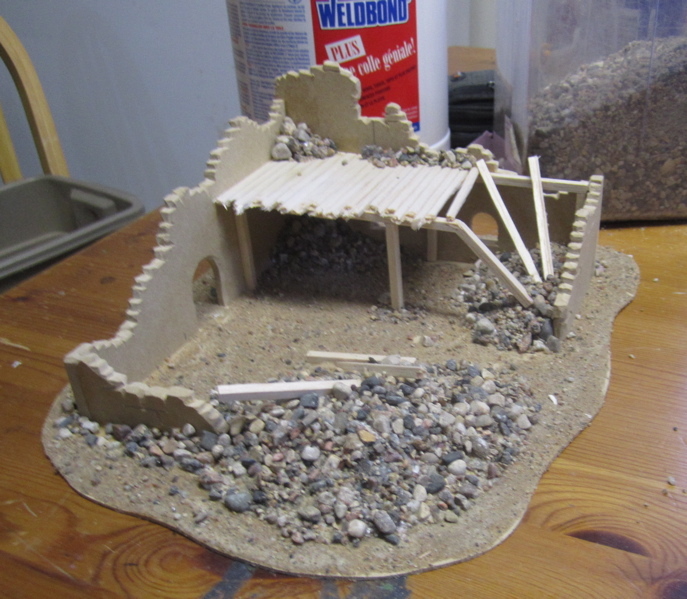 Sand and gravel rubble added. 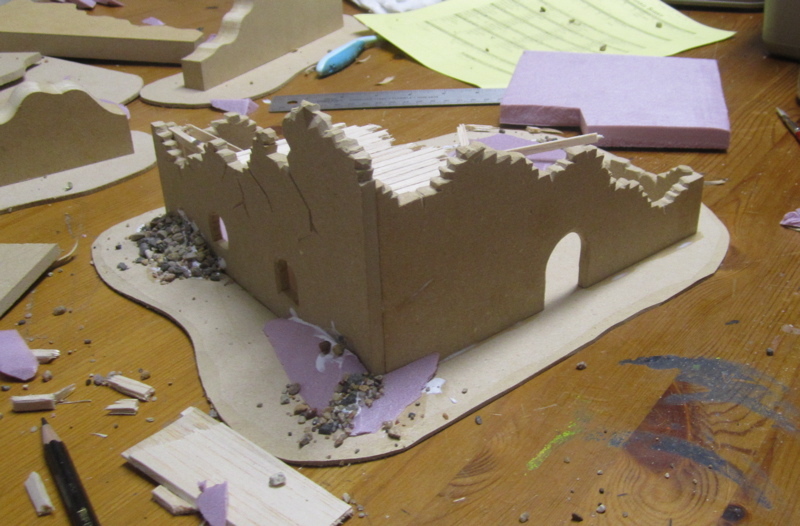 I suppose this could be a ruined Halfling bakery...? 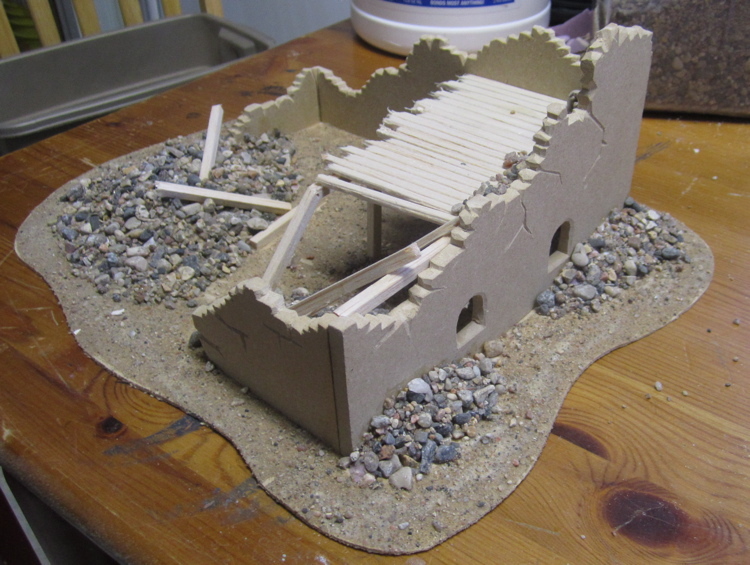 Another ruined building - this one is only one level, but has a few interior walls. 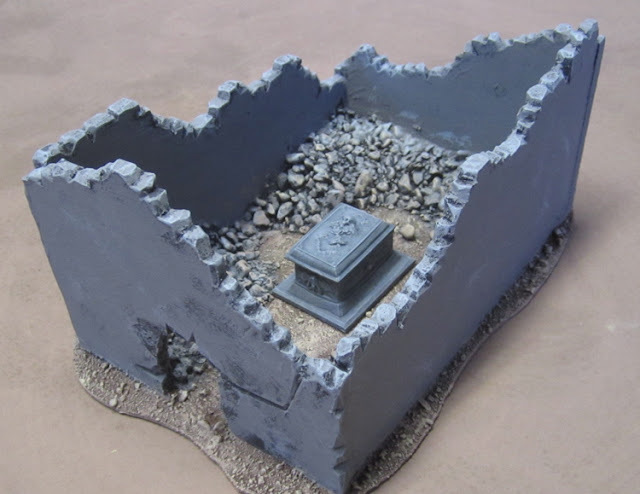 This was meant to be a mausoleum or some such building with a single entrance, but walls crumbled low enough in one corner that they could be scaled. 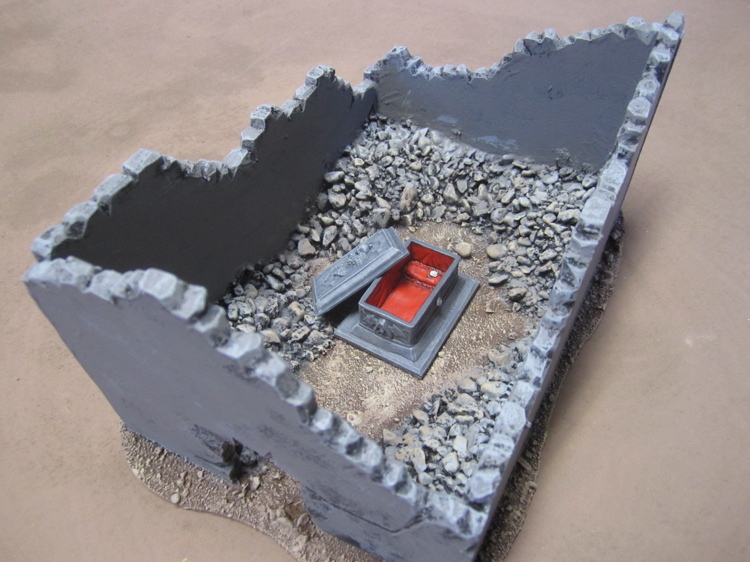 I left a flat enough area in the center so I could place this Sarcophagus from Reaper Miniatures - which I also just finished up this week! Hmmm... that looks a less like a "final resting place" and more like "fresh linens"... Who could be residing in here!? 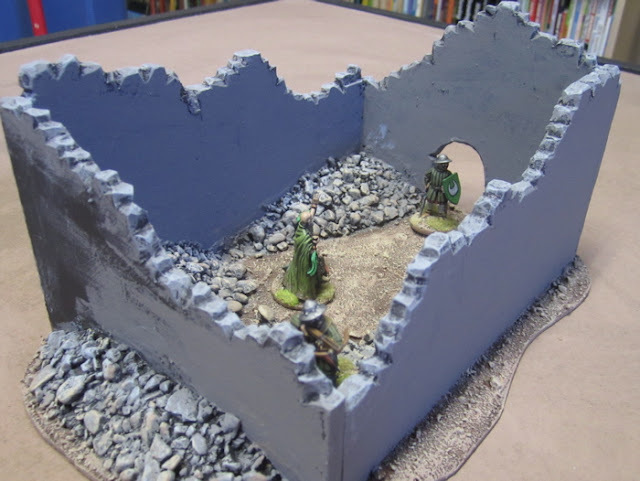 Find out in the Frostgrave Campaign Weekend game report - coming up next. 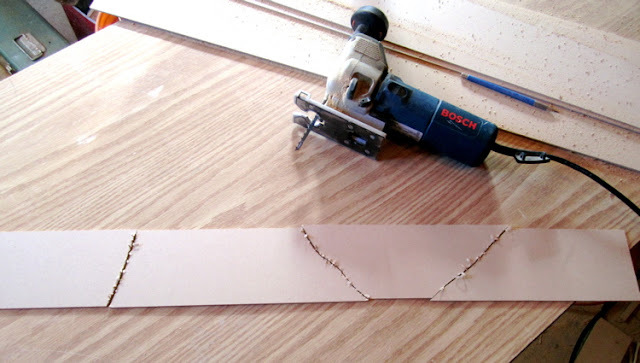 While not exactly step-by-step instructions with plans and measurements all laid out, I hope this has been helpful and/or inspiring to at least some of you! If you do make anything inspired by these please post a link to pictures of them in teh comments section below! More Medieval Muslims and Halflings. etc. 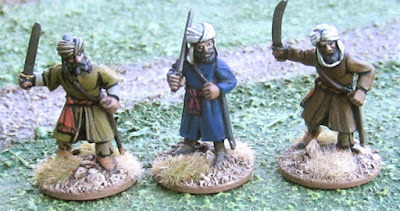 Four more Arabian Fantasy figures from Mega Miniatures. The three on the left I thought I’d use as Magicians/Wizards/Apprentices and the fellow on the right could be an Apothecary…? 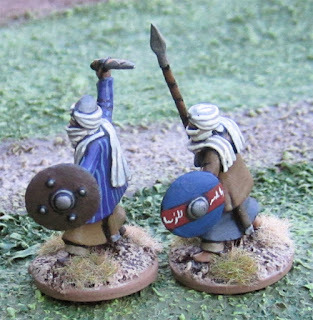 Two more Medieval Muslims of unknown manufacture. Nine Halflings from Black Tree Design. 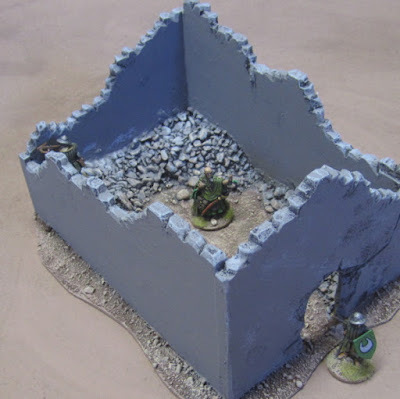 I am one Halfling short of 60 which will make me 6 units for Dragon Rampant - once I finish up that last one I’ll get some pictures of the entire force. 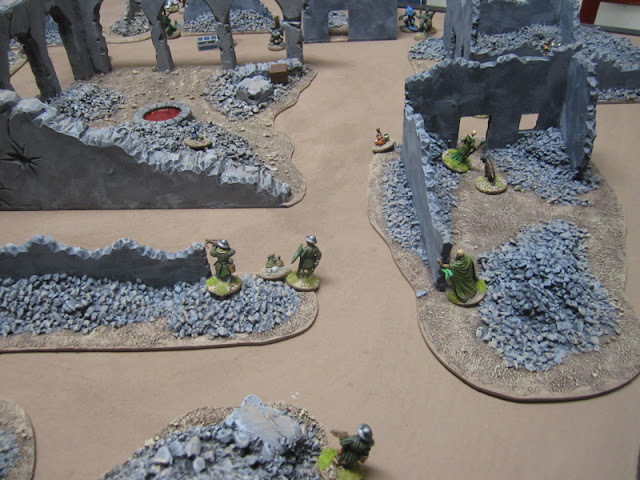 I’d originally thought I’d Light Foot and Light Missiles, but I think I’ll end up with four units of Light Foot Mixed units (a mix of hand weapons and missile weapons) @5 points each and two units of Scouts @ 2 points each for a total of 24 points. 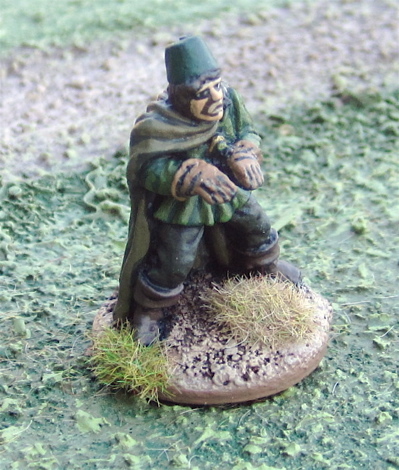 Finally a young apprentice for a Green Wizard – the figure is an old Citadel Miniature I’ve had since the 80’s and stripped of it’s old paintjob some time ago and just now got to re-painting. 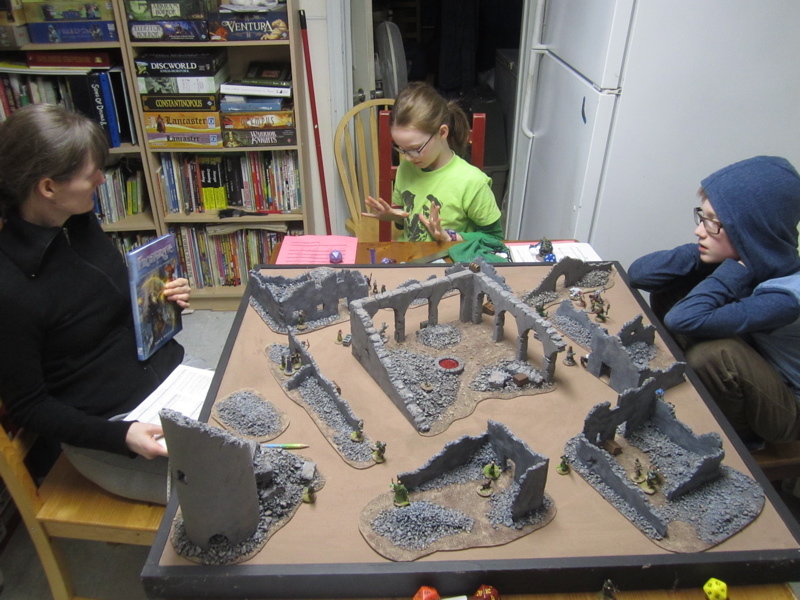 Finally got in a third game in our Family Frostgrave campaign. 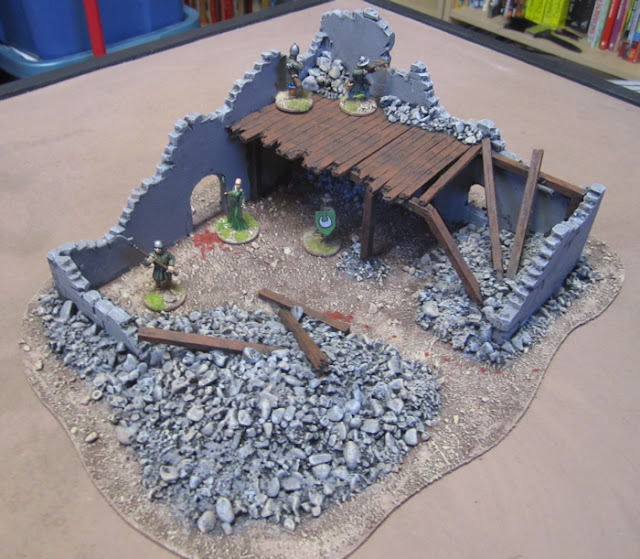 This week we played the Well of Dreams and Sorrows scenario (to make use of my new pool/ruined temple terrain). 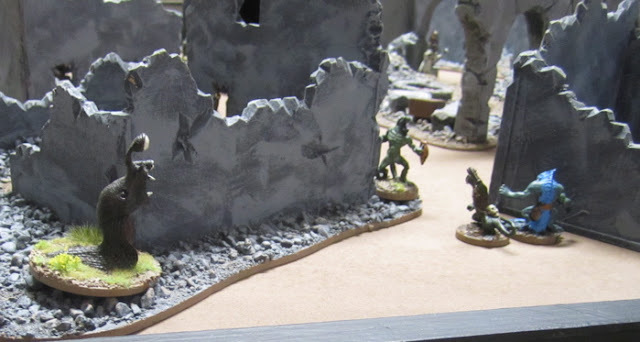 In addition to this I wanted to try out some new Wandering Monsters Rules. 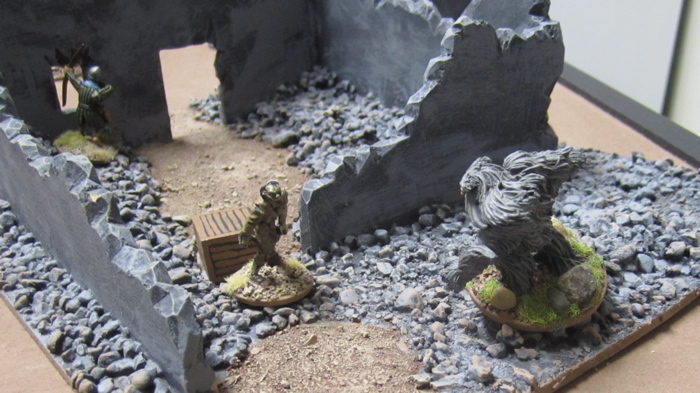 Unless there are specified monsters on the table to begin with, after placing treasures, each player places one monster on the table. It cannot be within the deployment zones, and it cannot be placed within 6” of another monster (though it can be placed as close as you want to any treasures!! I floated these to the family to see if they were interested in either seeding the table or adding more wandering monsters (or BOTH!) and they decided to try out More Wandering Monsters option. 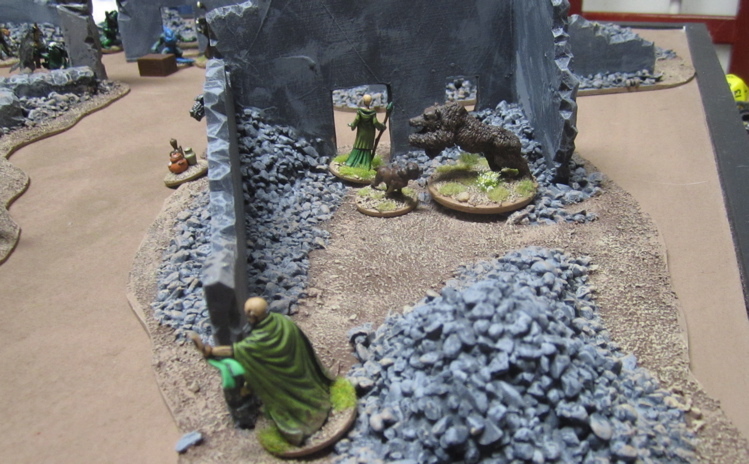 Before the game Alvareda the Soothsayer decided to let Cerebus go (he was injured anyway). She also gave Alfonso and Jenny the boot. She had a bunch of custom made armour and other livery made for her warband. Lars and Darragh were given some of this new armour (I replaced their figures with fancy new ones) and then hired a second Man-at-Arms to replaced the deceased Other Darragh (the new one is named Peter – though most just call him “Pip”), a second Archer (named Arnold), two crossbowmen (Fred and Reginald) and a knight (named Sir Bertram). Wil the Theif was kept around as was Spike the dog (now housed in his new kennel). Before the game Alvareda also used the second Raise Zombie to keep Barry the Zombie animated to help carry treasure. Amanda decided to try something entirely new. Again. This time she returned to using a Thaumaturge (Seriously I think it was just so she could burst into her rendition of Blinded by the Light whenever she cast Blinding Light). The new wizard, Miranda, was joined by her apprentice, Sandra, and two Archers (Nancy and Tammy), a Ranger (Arwen), a Treasure Hunter (Georgina) and a Thug (Bonita). Before the game she also successfully summoned a Snow Leopard animal companion, which she names Meow-Meow. 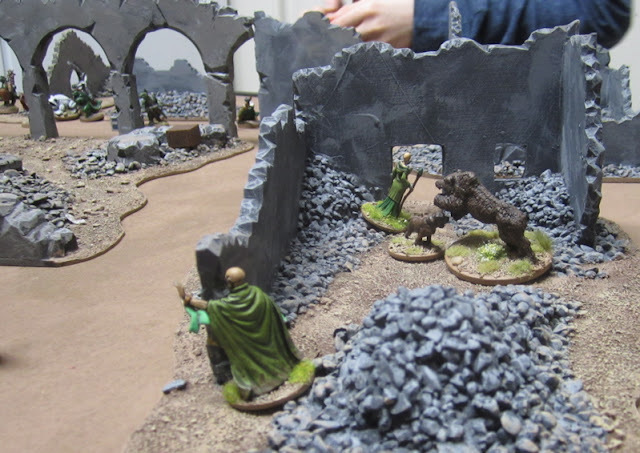 The Boy carried on with his Lizard Wizard Warband… though he added… something… I forget what it was… Oh, yeah, it was a Treasure Hunter! 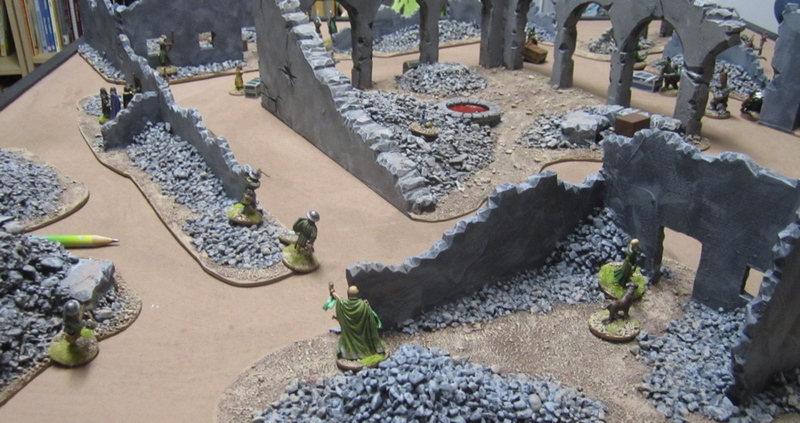 But he was also making use of an Illusionary Soldier scroll he picked up in a previous game and put tow of them out. 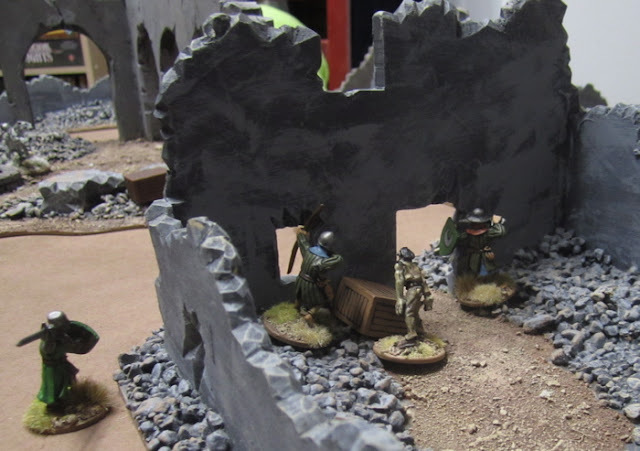 The Soothsayers Soldiers surge forward. 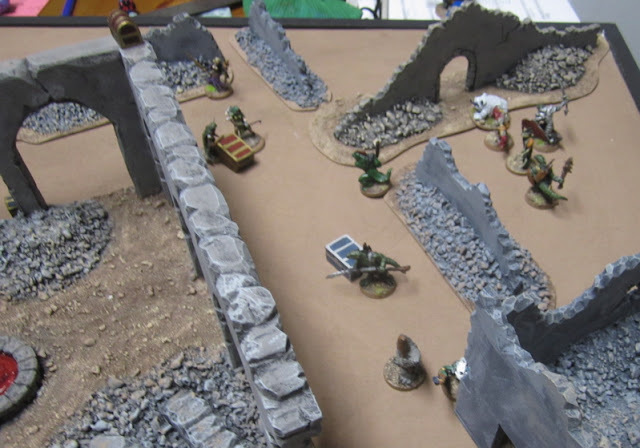 The Boy’s Lizards and The Girl’s Enchanters fight over treasure on the other side of the table. During the first Monster Phase a BEAR came roaring onto the table and attacked Spike the dog. 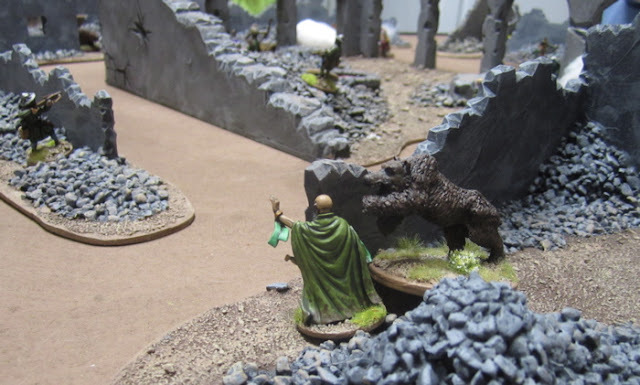 Spike is apparently not scared of bears and tore its throat out or something because he took that beastie down with one blow (rolled a 20). 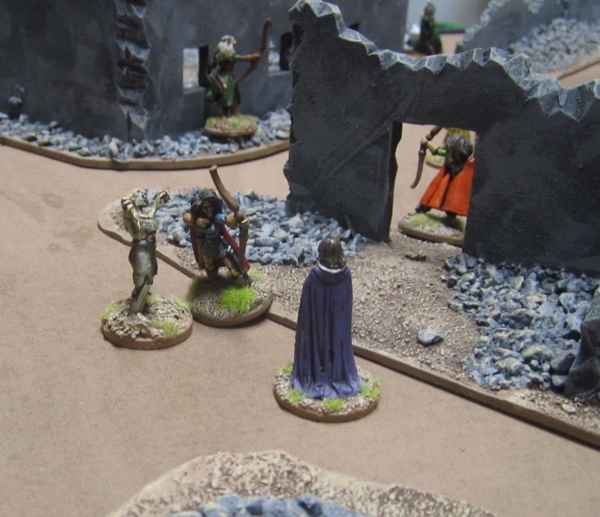 Then a zombie wandered on Amanda’s side of the table and attacked the Archer that was under Jonquil’s control (that chick just can’t catch a break…), but despite being wounded (with ONE wound left) she managed to defeat the zombie and push it out of contact. A Minor Demon slithered into existence at the corner between me and The Boy – it spotted his Treasure Hunters and went chasing after them. Barry the Zombie grabbing some treasure. Lars took up a position at the window and started shooting arrows at the Lizards (who killed his other brother Darragh). Darragh also awaits an opportunity to avenge his other brother. The lizards advance and a storm of Bone Darts took down Wil the Theif. 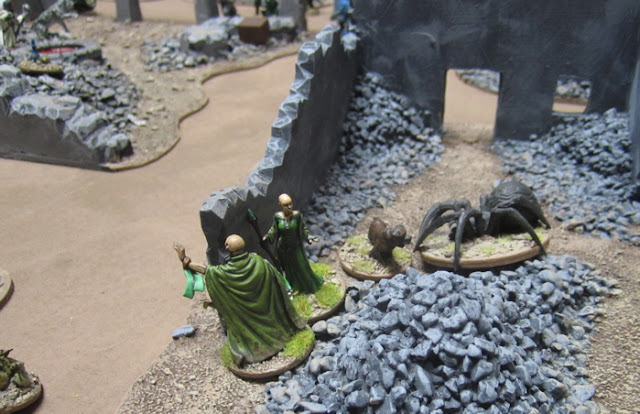 At the end of Turn Two an Ice Spider stormed onto the table… and was also taken down by Spike! Spike is pretty awesome – so glad I shelled out the 250 gold for the kennel! 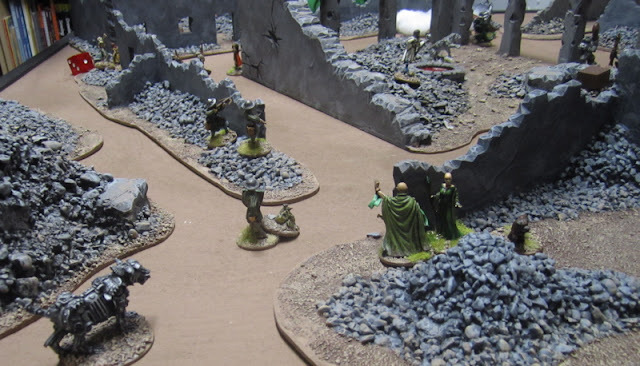 And then a Medium Construct wandered onto the table from the corner between me and Amanda… Luckily my Soothsayers also have Control Construct! On the following turn they cast it and took control of the Construct! Darragh and Ser Bertram Rush out to attack the advancing Lizards. 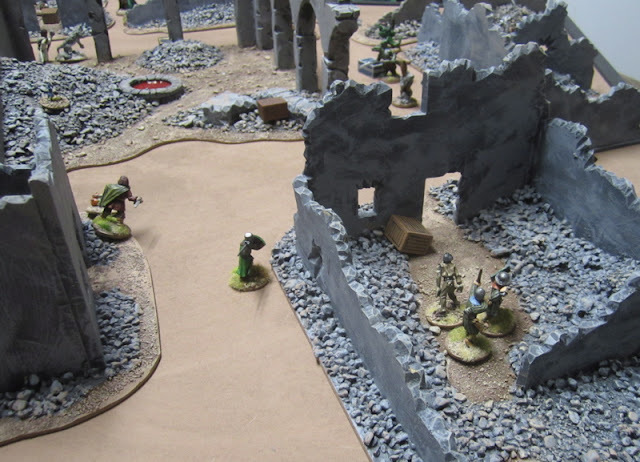 Darragh struck out wildly wanting to avenge his brother – he was careless, though, and took a serious blow to his midsection and started to bleed profusely… A second blow from the lizard took him out of action. A SNOW TROLL shows up in the corner and heads towards Barry the Zombie – luckily Barry had just enough move to get to that table edge and escape before the Snow Troll got to him. Miranda got to the pool and had her drink, as she was retreating Alvareda moved forward to get some (but not until first healing herself up a bit and casting combat Awareness!). meanwhile Fred, being totally useless at hitting stuff with his crossbow, decided to go for some more treasure. Jonquil takes down the bear. Alvareda takes a drink for the Well of Dreams and Sorrows. The Thaumaturge’s Ranger grabs some treasure on the other side of the ruined temple. All this while the Lizard witch was stuck in a four-way melee invoving on of his soldiers, Sir Bertramn and Meow-Meow the Thaumaturge’s Snow Leopard. 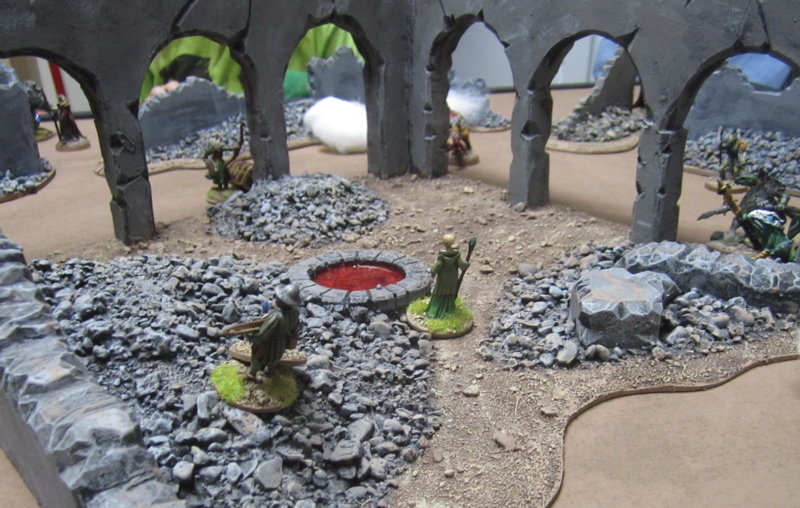 In the final round an imp slipped onto the table and took out Jonquil (The Boy rolled a 20 for it’s combat roll…) – checking for casualties we found that Jonquil and Darragh both died of their wounds! Alvareda was beside herself – he wan’t the most competent apprentice, but he was loyal – so she quickly gathered up the treasure they collected and has his still warm corpse dragged to a Healer in one of the border towns and paid just about all the loot they’d gathered to have him resurrected. The magic seems to have worked, but Jonquil seems a bit skittish and even more distracted and forgetful… hopefully it will work out. Lars, of course was devastated with the loss of Darragh… With both his brothers dead he has been in a blind fury – Though he saw the Lizard Witch fall from his arrow, he knows all too well that he could very well have survived the blow and can’t wait to get back to the Frozen City and that Lizard warband so he can slay them ALL! Reginald never recovered from being blinded during the game. As he was slowly trying to make his way off the table, he was gored by a giant Boar… Luckily there were other nearby targets for the boar so he moved on, not damaging Reginald further. Reginald was able to make his way back to the base and some healing has put him right – he’ll be ready for action next time around. Arnold and Wil – both taken out by Bone Darts – also recovered from their wounds, as did Spike – who was swatted by the bear. In the end Alvareda gained 400 experience! (100 for spells, 200 for treasures, and 100 for drinking from the Well of Dreams and Sorrows). Among the four treasures were found 90 gold (seriously… four treasures, 90 gold… how does that even happen!? ), a Magic Staff of +2 damage, A Magic Shield of +1 Armour, Two healing potions and a Demon in a Bottle, and an Amulet of Resistance. The gold, the Staff, the Demon, and the Amulet were all sold/traded away to pay for Jonquil’s resurrection (310 gold – essentially what it would cost to hire a new experienced apprentice – I didn’t want to have to find a new figure so we said he was resuraected…) and to hire a new Man-at-Arms to replace Darragh. The magic Shield was kept and given to Sir Bertram, who (luckily) quickly recovered from his wounds. The Lizard Wizard did recover from the arrow wound as did most of the casualties suffered by his warband - the Ice Toad, both Lizard-at-Arms, the Treasure Hunter, and an Infantrylizard were all knockedout of action, but recovered from their wounds. The Barbarian Lizard was not so lucky. He bled out before he could be healed and died somewhere among the ruins… The wizard gained 250 experience (100 for drinking form the Well, 60 for spells – mostly deadly bone darts and annoying fogs, 50 for their solitary treasure, 120 for enemy soldiers taken out of action – mostly be Bone Darts, and 20 for the Laboratory at their home base. The single treasure they obtained included 150 gold (seriously – one treasure, and he gets more gold that in all four of mine!?) and a Grimoire of Awareness. 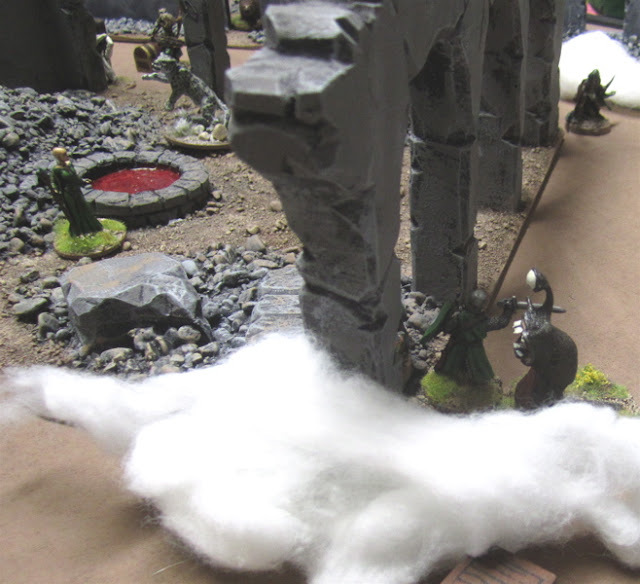 The Girl’s new Enchanter nearly lost her apprentice! She suffered a permanent injury fighting the Snow Troll they wandered into – a lot eye! 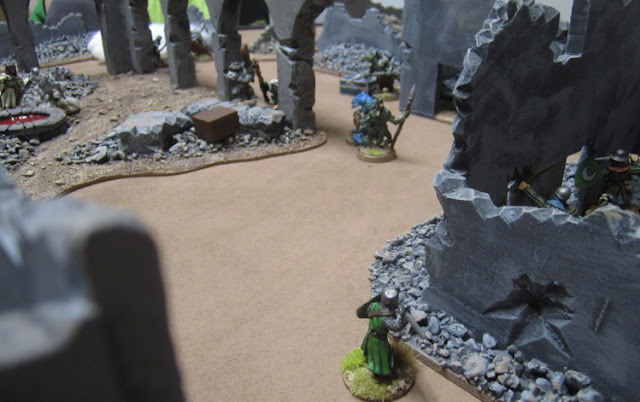 The Man-at-Arms and Thug that were taken out of action suffered only minor injuries, but the archer will miss the next expedition due to his injuries. 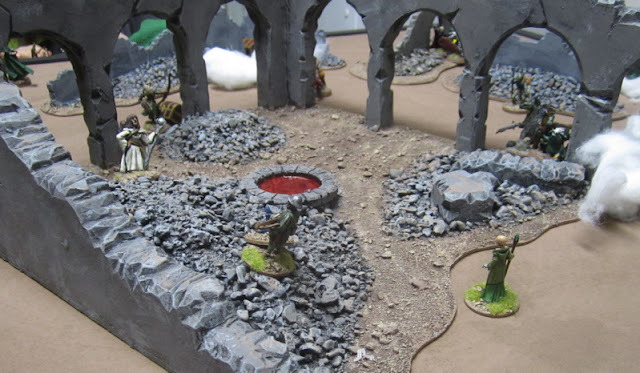 The wizard gained a total of 300 experience - 60 for the level difference, 50 for spells, 40 for enemy taken out of action, and 150 for treasures. Among those treasures she collected a total of 240 gold, potions of explosive cocktail and healing, and grimoires of Steal Health and Leap. Amanda’s New Thaumaturge managed to get her warband in and out with a minimum of injuries. In fact, the only they sustained was the Archer that had been mind controlled by the Soothsayers and had to be knocked unconscious by her own warband to keep her from causing any further disruption to their expedition. She recovered just fine. The wizard earned 420 experience – 60 for the level difference, 110 for spells, 100 for drinking from the Well, and 500 for treasures. Among the Treasures they collected 250 gold, a dagger of +1 damage, and Grimoires of Raise Zombie and Decay. I finished up a few more figures over the weekend so hopefully I’ll get to posting some pictures of them tomorrow. I might also try to post some pictures of the terrain I’ve been working on.